The contradiction backtracing algorithm is the most interesting part of Shapiro's algorithmic error diagnosis framework [Sha83], as it has some philosophical implications for the refinement of scientific theories [Sha81]. 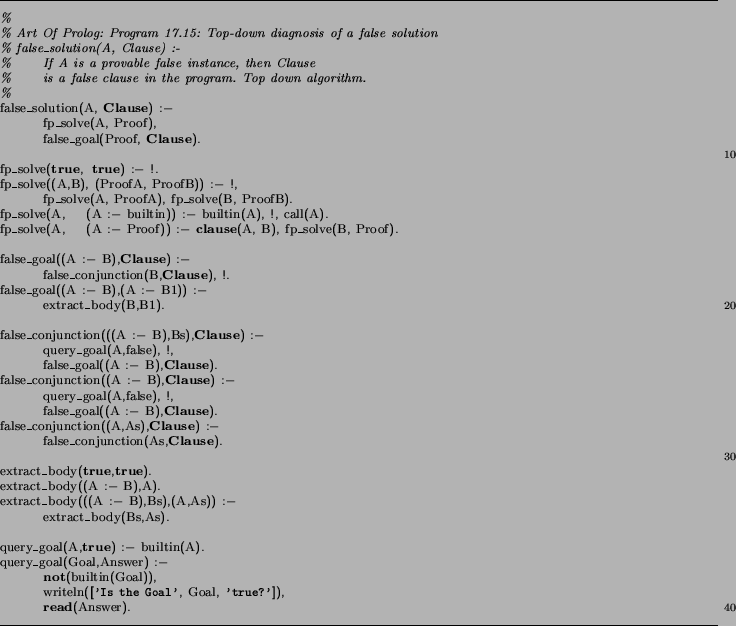 This algorithm exploits the simple logical semantics of pure Prolog, and so an understanding of refutation theorem proving in general and the resolution calculus specifically is required (Section 1.2) to understand this section. A theory that proves a negative observation . We say that is overly-general; it is unsound relative to the concept the oracle has in mind. The core of the algorithm is the following: as pure Prolog has only one mechanism for getting work done (a SLDNF-resolution step: unification of a body goal with the head of a clause), there are only a very few possible sources of bugs. In particular, if can prove , then it must be the case that there is at least one clause whose head is asserted false by the oracle, and whose body is deemed to be true in (there is a proof of this assertion in [Sha83, p38]). Given this characteristic of the faulty clause, diagnosing incorrect solutions boils down to searching for one that has it. [Sha83, Section 3.2] presents several querying strategies with varying query complexity, which is defined to be the asymptotic number of times the oracle is consulted in terms of the size of the computation (proof) tree. In effect, this metric measures the data-hungriness of this diagnosis algorithm. ...At each node it tries to find a false [child]. The algorithm recurses with any false [child] found. If there is no false [child], then the current node constitutes a counterexample [and indicates the faulty clause], as the goal at the node is false and all of its [children] are true. It should be apparent that this algorithm queries the oracle a number of times that is a linear function of the depth of the proof tree. Shapiro proves that his divide-and-query strategy (not presented here) is query-optimal, that is, it makes the most efficient use of the oracle for this task. The idea is an application of the classic divide-and-conquer paradigm, and bears a striking similarity to binary search: imagine the proof tree as a linear structure; query the node that lies nearest the middle, then recurse in the half where the bug must lie. This algorithm is logarithmic in the number of nodes in the proof tree. Figure 2: A Prolog program for backtracing contradictions. Once such a bug has been discovered, the Model Inference System retracts the clause that has been identified as the culprit of the missing solution, and marks it as being unsatisfactory. A later pass will refine such marked clauses into more specific ones (Section 3). Finitely failing to prove something that it should be able to. Shapiro developed a missing solution algorithm that localises the cause of such bugs. Exhausting the stack during a proof attempt. There is a stack overflow algorithm that determines the cause of this mis-behaviour. Shapiro has presented (some of) these algorithms in at least three places [Sha81,Sha83,SS94], with varying degrees of sophistication. These algorithms are useful for declarative debugging [Llo87a], independently of their usefulness in machine learning.